December has finally arrived, and with it the hurly burly of the Christmas season. We made the mistake of trying to go to the mall on Friday – Black Friday. We got a taste of what is to come. It wasn’t pretty. Mmmmm… 1 cup of butter. From now on it won’t be fit to go to any of the malls or consumer business parks, unless you want to spend the day in traffic and then in checkout line-ups. And what is the result? Buying “tat” that people don’t want or need. That’s why making edible gifts make so much sense. This month I’ll be posting ideas on presents from the heart, instead of from the wallet. I post every second day, so from now until Christmas there will be 12. My own 12 Days of Christmas. 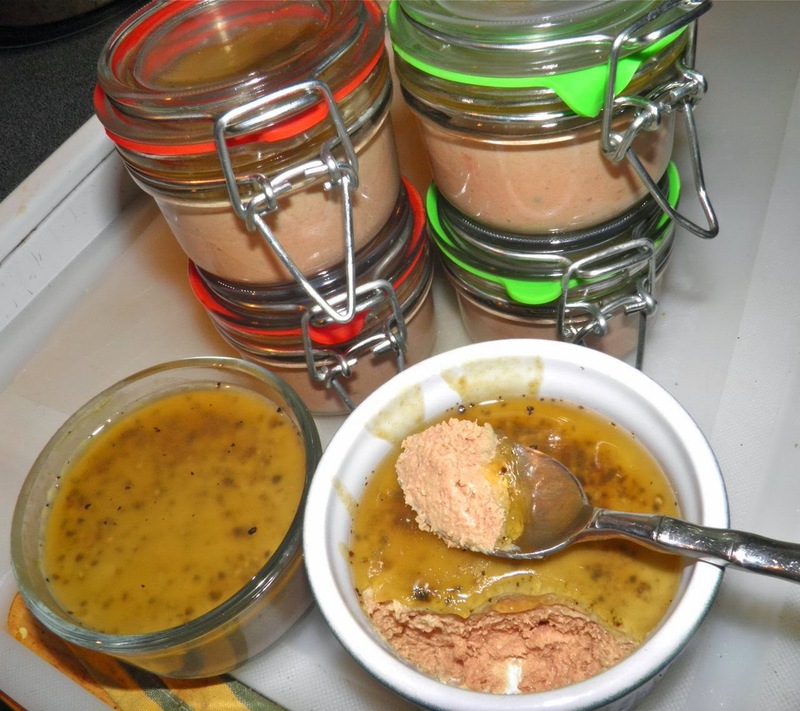 First up, faux foie gras. Foie gras (French for "fat liver") is the liver of a duck or goose that has been purposefully fattened. For many people this is a non-starter because there is concern that it harms the birds. 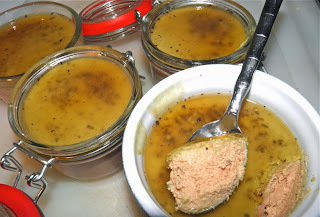 On an episode of Diary of a Foodie, a TV show by the now defunct Gourmet magazine, we were taken to a French foie gras farm where the geese seemed to be treated quite well, and were free-range. They were force-fed, but didn’t seem to be harmed in any way or caused much, if anything, in the way of distress. There are good farmers and bad farmers everywhere. I would imagine, like everything else, the truth about force feeding lies somewhere between. The extremes of either end of an ethical question should equally be mistrusted. So what if you could avoid the issue all together? No one cares about chickens, right? That's what this recipe uses – chicken livers. 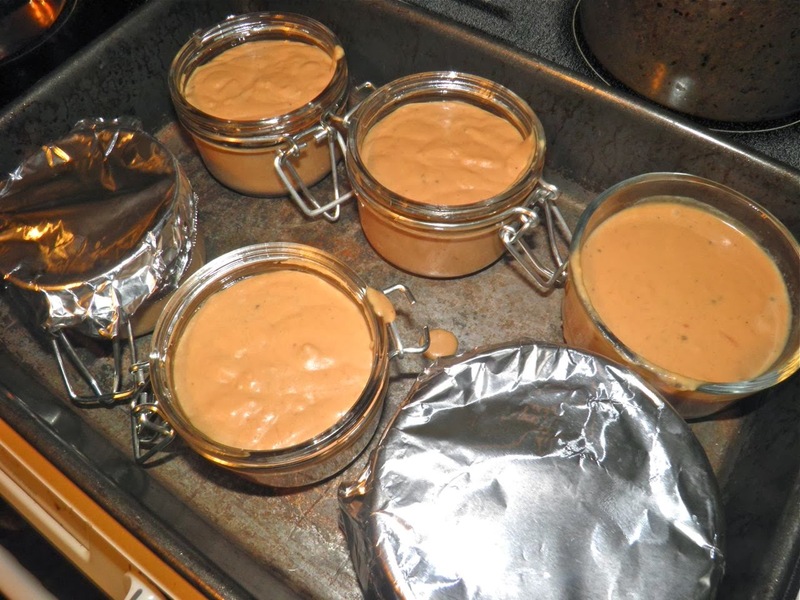 The result is a pâté that is very, very reminiscent of foie gras without any of the guilt. It is smooth, creamy, rich and delicious. I based mine on the main recipe from the Diary of a Foodie episode I spoke of above, but made some alterations. To pretty up as a gift I purchased four cage-top jars at a “dollar store” at about $1.50 each. I think they were about 1/2 cup in size. The cage-tops make them look very special. In hindsight I should have purchased more jars, or bigger ones, because by the time they’re empty you will be looking for more. I filled four, plus two custard ramekins. This was a real hit last year when I made it. All it needed was a crusty baguette. That would be another great post for this month. It also would go quite nicely with my previous post on how to make brioche using your mixer. These pots-de-delight are sealed with gélee, but you may want to hold off making them until a week before Christmas. Better safe than sorry! The mousse is baked using a water bath. Preheat the oven to 300°F. Bring a kettle of water to a boil. To make the mousse, melt 2 tablespoons of butter in a saucepan. Add the onion and garlic and sauté on medium low until the onion is translucent, about 8 minutes. Add the truffle oil and remaining butter. 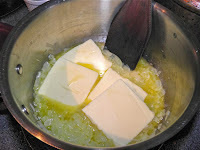 Stir until the butter melts. Clean any sinews and fat from the chicken livers. 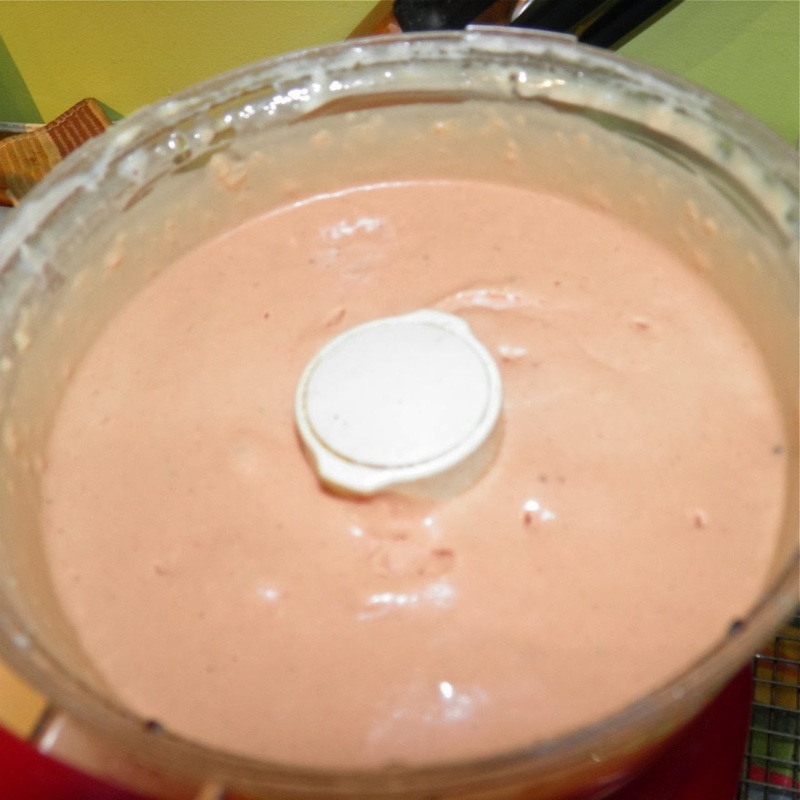 Place the onion mixture and cream in a food processor. Process until the mixture is smooth. With the motor running drop the livers in, one at a time. Add the salt and pepper and process until very smooth. The mixture will be very light in texture. Do not taste it. It’s raw liver! The mousse sets up more. This was taken before fully cooled. Arrange the mousse baking dishes in a 9”x13” dish. Fill each small dish to about 1/4” from the top with the mousse mixture. Wrap the top of each one with foil and fill the 9x13 with water to about halfway up the sides of the mousse containers. Place in the oven and bake for 30 minutes. The mousse will be set through to the centre. Remove from the water bath and let cool for at least 2 hours on the counter. Once the mousse is cool, make the gelée. Pour the chicken stock into a small saucepan. Sprinkle the gelatin on top of the stock and let soften for about one minute. Slowly heat the mixture to just below boiling, swirling to make sure the gelatin dissolves. Remove from the heat, stir in the sugar and hot sauce. Sprinkle a generous amount of cracked black pepper (must be cracked, not ground) on top of each pâté. Spoon about 2 tablespoons of the gelée on top and let set. Once the gelée sets, cover tightly and refrigerate. To show the result I dipped in with a spoon before they were refrigerated. They will firm up more. This is really rich, delicious stuff. The truffle oil makes a world of difference. * If you can find them, duck livers would make this even closer to real foie gras. I don't think you can get them here in Halifax.